^ Yang, S; DH Pfister. 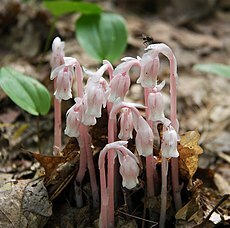 Monotropa uniflora plants of eastern Massachusetts form mycorrhizae with a diversity of russulacean fungi. Mycologia. 2006, 98 (4): 535–540 [2018-08-14]. PMID 17139846. doi:10.3852/mycologia.98.4.535. （原始内容存档于2009-07-19）. ^ 2.0 2.1 2.2 2.3 2.4 2.5 Martin I. Bidartondo. The evolutionary ecology of myco-heterotrophy 167 (2). New Phytologist: 335-352. 2005. doi:10.1111/j.1469-8137.2005.01429.x. ^ 5.0 5.1 5.2 5.3 Bidartondo, Martin I. The evolutionary ecology of myco-heterotrophy. New Phytologist. 2005-04-12, 167 (2): 335–352. ISSN 0028-646X. doi:10.1111/j.1469-8137.2005.01429.x. ^ 6.0 6.1 6.2 6.3 6.4 Plants parasitic on fungi: unearthing the fungi in myco-heterotrophs and debunking the ‘saprophytic’ plant myth. Mycologist. 2005-08-01, 19 (3): 113–122. ISSN 0269-915X. doi:10.1017/S0269-915X(05)00304-6. ^ Trudell SA, Rygiewicz PT, Edmonds RL. Nitrogen and carbon stable isotope abundances support the myco-heterotrophic nature and host-specificity of certain achlorophyllous plants 160. New Phytologist: 391–401. 2003. doi:10.1046/j.1469-8137.2003.00876.x. ^ Bidartondo MI, Burghardt B, Gebauer G, Bruns TD, Read DJ. Changing partners in the dark: isotopic and molecular evidence of ectomycorrhizal liaisons between forest orchids and trees 271. Proceedings of the Royal Society of London, series B: 1799–1806. 2004. doi:10.1098/rspb.2004.2807. ^ Selosse M-A, Weiss M, Jany J, Tilier A. 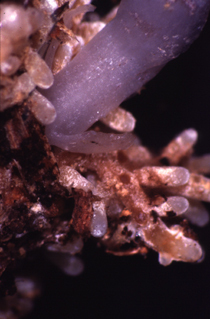 Communities and populations of sebacinoid basidiomycetes associated with the achlorophyllous orchid Neottia nidus-avis (L.) L.C.M. Rich. and neighbouring tree ectomycorrhizae 11. Molecular Ecology: 1831–1844. 2002. doi:10.1046/j.1365-294X.2002.01553.x. ^ Peter Kennedy. Common Mycorrhizal Networks: An Important Ecological Phenomenon. MykoWeb (originally published on Mycena News). November 2005 [2012-01-19]. （原始内容存档于2012-02-04）. ^ Martos F, Dulormne M, Pailler T, Bonfante P, Faccio A, Fournel J, Dubois M-P, Selosse M-A. Independent recruitment of saprotrophic fungi as mycorrhizal partners by tropical achlorophyllous orchids 184. New Phytologist: 668–681. 2009. doi:10.1111/j.1469-8137.2009.02987.x. ^ Gebauer G, Meyer M. 15N and 13C natural abundance of autotrophic and myco-heterotrophic orchids provides insights into nitrogen and carbon gain from fungal association 160. New Phytologist: 209–223. 2003. doi:10.1046/j.1469-8137.2003.00872.x. ^ Selosse M-A, Roy M. Green plants eating fungi: facts and questions about mixotrophy 14. Trends in Plant Sciences: 64–70. 2009. PMID 19162524. doi:10.1016/j.tplants.2008.11.004. ^ Smith, S. E.; Read, D. J.; Harley, J. L. Mycorrhizal symbiosis 2nd. San Diego, Calif.: Academic Press. 1997. ISBN 0126528403. OCLC 35637899. ^ Taylor DL, Bruns TD, Leake JR, Read DJ. Mycorrhizal specificity and function in myco-heterotrophic plants. (编) Sanders IR, van der Heijden M. Ecological Studies (PDF). Mycorrhizal Ecology 157 (Springer-Verlag). 2002: 375–414 [2018-08-14]. ISBN 3-540-00204-9. （原始内容存档 (PDF)于2017-05-31）. ^ 17.0 17.1 Imhof S. Arbuscular, ecto-related, orchid mycorrhizas—three independent structural lineages towards mycoheterotrophy: implications for classification? 19 (6). Mycorrhiza: 357–363. 2009 [2018-08-18]. （原始内容存档于2018-08-18）.